No Palestinians said injured in Israeli airstrike in southern Strip; thousands rally at border, attack troops, as boats attempt to break blockade but are driven back by army.. In the evening several thousand Palestinians protested on Gaza’s border with Israel, throwing rocks and firebombs and burning tires, the army said. IDF troops used tear gas and live fire to beat back the protesters in the northern Strip. 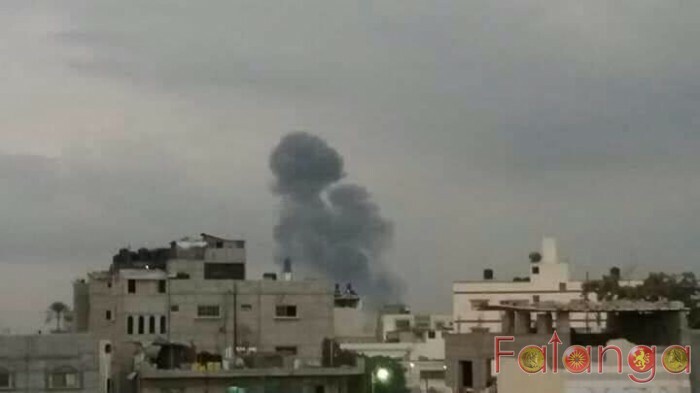 The Hamas-run Gaza health ministry said dozens of Palestinians had been hurt by smoke inhalation and shrapnel, while at least 30 suffered injuries from live fire. The army also said a flotilla of boats that attempted to breach the blockade on Gaza’s maritime border were driven back by the Israeli navy. The airstrike and continued arson attacks came after Israel’s high-level security cabinet met for four hours on Sunday afternoon to discuss swirling tensions in Gaza. The rising border tensions peaked on Friday amid heavy rioting at the fence separating Israel from Gaza. Seven Palestinians were killed, including three who breached the border fence and ran toward IDF soldiers during the chaotic unrest. Prime Minister Benjamin Netanyahu issued a sharp warning to Gaza’s ruling terror group Hamas earlier on Sunday, suggesting Israel could be on the brink of a wide-scale military offensive if violent riots along border fence persisted.